According to fundraising forecaster The Atlas of Giving, charitable donations from the US reached a record $416.5 billion in 2013, a 13 percent jump over the previous year. That’s a lot of giving! In fact, the United States has been ranked the most generous nation on earth, according to the 2013 World Giving Index. If you’re a school group, athletic team, or a social or religious organization looking to raise money in the United States, consider yourself lucky. Value – Fundraising cards have a higher perceived value and offer a stronger selling proposition than other fundraising methods. 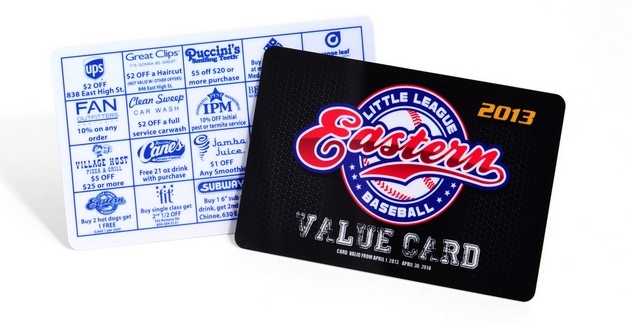 While the perceived value of candy bars and car washes quickly diminishes, a fundraising card offers year-round value that is strengthened by partnering with well-known restaurants and retailers in your community, piggybacking on their brand equity. 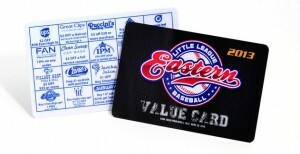 This will also add legitimacy to your fundraising card, making it easier to sell. 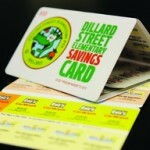 Cost – Fundraising cards are affordable. Selling just eight cards for $20 each can cover the cost of printing 250 cards. The more cards you purchase, the cheaper the cost per card, providing a higher profit margin than other fundraising strategies. Long-Term Partnerships – Every partner logo on your fundraising card represents a potential long-term relationship. Successful fundraising cards generate money for both the fundraising organization and the fundraising partner, making it much more likely that your partners will re-up the following year. As word spreads, you may have to enlarge your card to accommodate the number of interested partners – a good problem to have. Tracking Sales – Since many fundraising cards are sold door-to-door by student athletes and other groups, it’s easy to track the location of each sale. Card purchasers who bought from you last year will be waiting for their doorbell to ring, hoping they make it onto your route before their card expires. These are easy sales. Selling candy bars in front of grocery stores may deliver a small percentage of sale conversions for each pitch you make, but targeting qualified customers with a proven purchase history will get you to your goal more quickly.